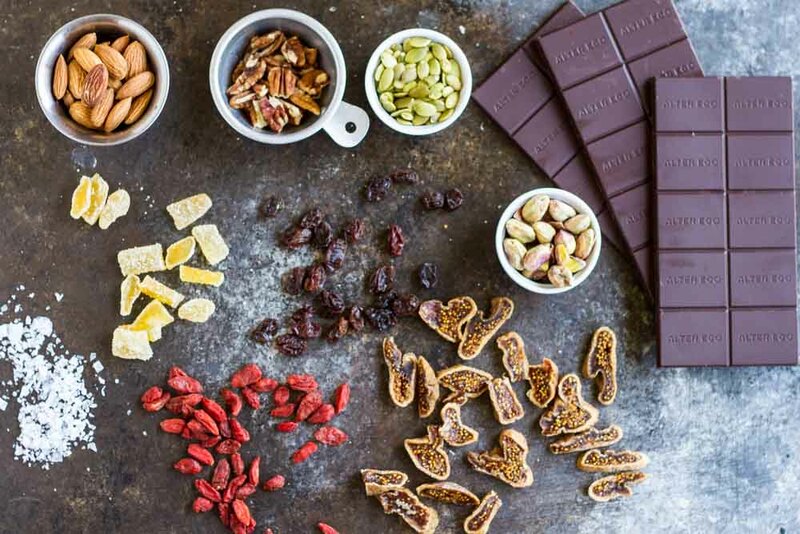 Healthy chocolate snacks loaded with all of your favorite nuts, seeds, and dried fruits. What’s not to love? 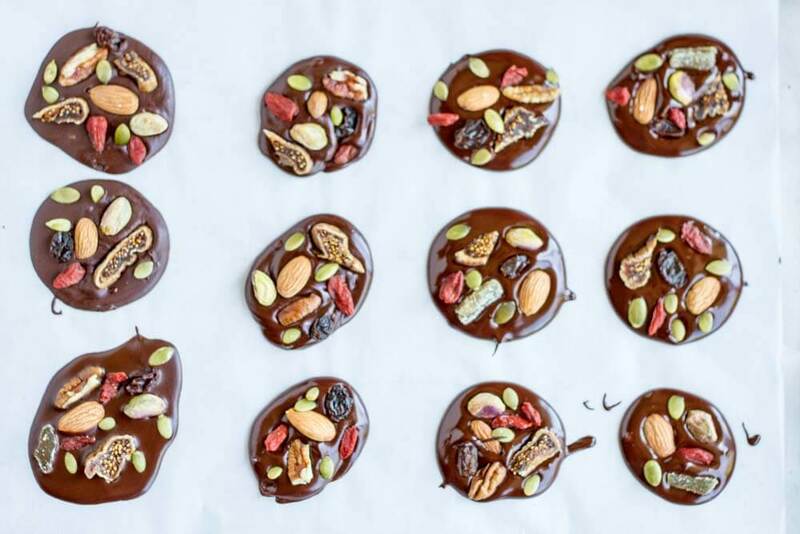 This recipe reminds me of the trail mix you can get in the bulk section of the health food store that’s loaded with little morsels of chocolate. Salty, sweet, and deliciously chocolatey. Last week was the last week of kindergarten for my Little One. I usually like to send her teachers off with some sort of sweet treat to show my appreciation for all of the love and good work they put out during the school year. In my eyes, teachers are angels walking the Earth. And we have been so blessed at our local Waldorf Charter School to have the most loving, kind, and compassionate souls teaching our children. When trying to decide what to make our teachers, I knew I wanted to do something with chocolate. I rummaged through my kitchen pantry to see what I could come up with. I guess you could say that this is a kitchen sink sort of recipe as I basically pulled out several chocolate bars and all of the random containers of nuts, seeds, and dried fruits that we use to make our homemade trail mix. 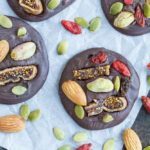 The inspiration for these little snacks comes from a traditional French confection that is typically made during Christmas called a mendiant. 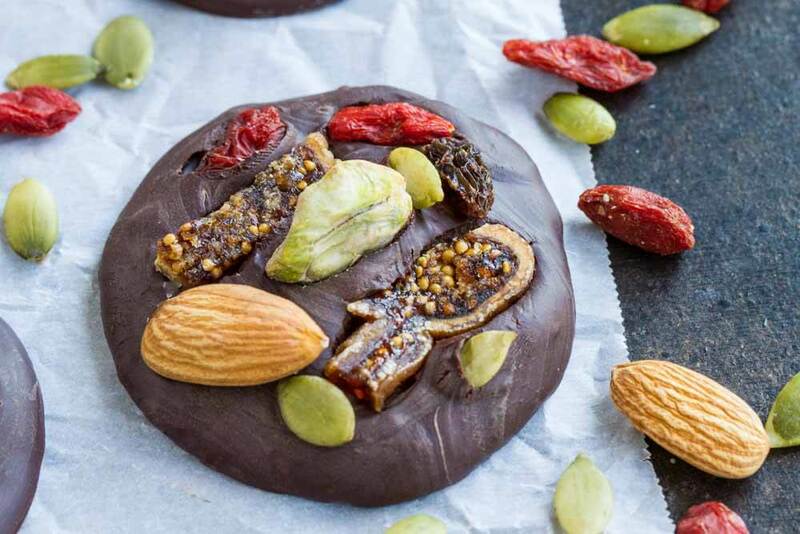 Chocolate mendiants are small disks of chocolate garnished with assorted toppings. Don’t they look lovely? And you can decorate them with whatever toppings you like. I used almonds, pistachios, pecans, pumpkin seeds, raisins, goji berries, dried figs, and crystalized ginger. I was going to do coarse sea salt flakes as well but forgot to sprinkle it on before they all set. Other things that you could use include shredded coconut flakes, walnuts, macadamias, sunflower seeds, dried cherries, dried cranberries….. you get the picture. The recipe is simple. 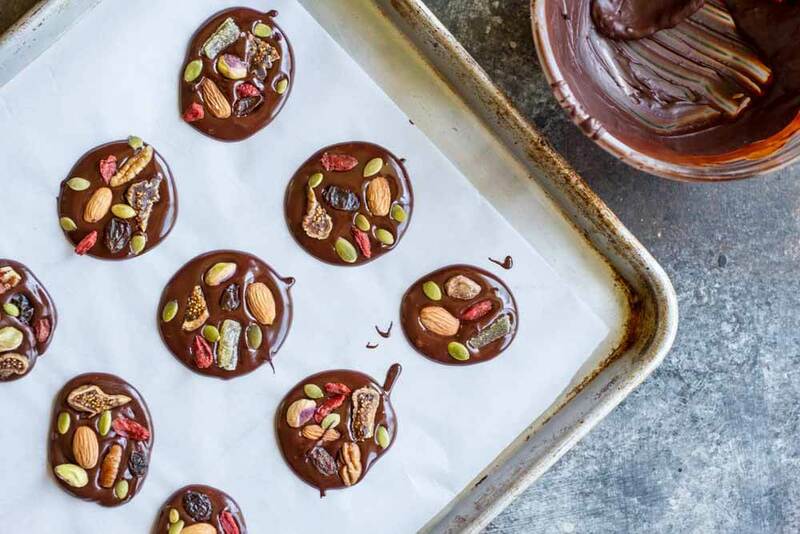 Melt chocolate, spoon onto a parchment paper lined baking sheet, sprinkle on toppings, and allow to set. Done. It took me a total of about 10 minutes to make these end-of-year treats for our teachers. 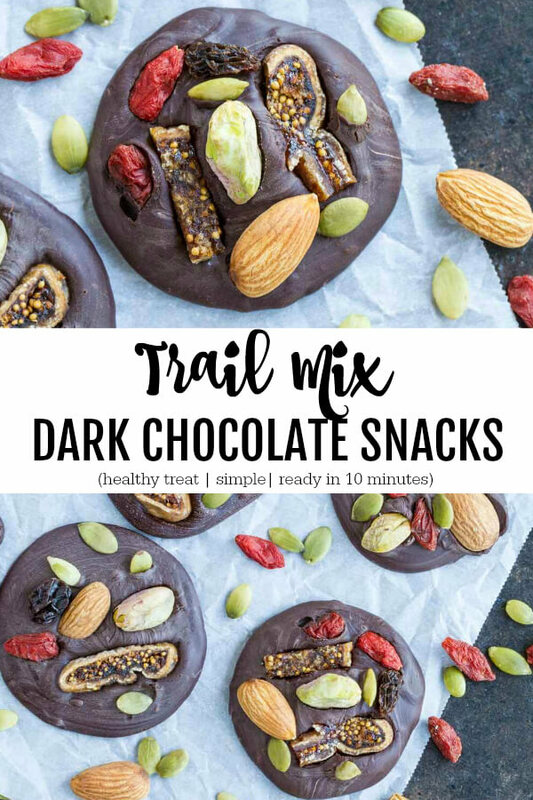 Now you have a healthy chocolate snack loaded with all of your favorite trail mix ingredients. 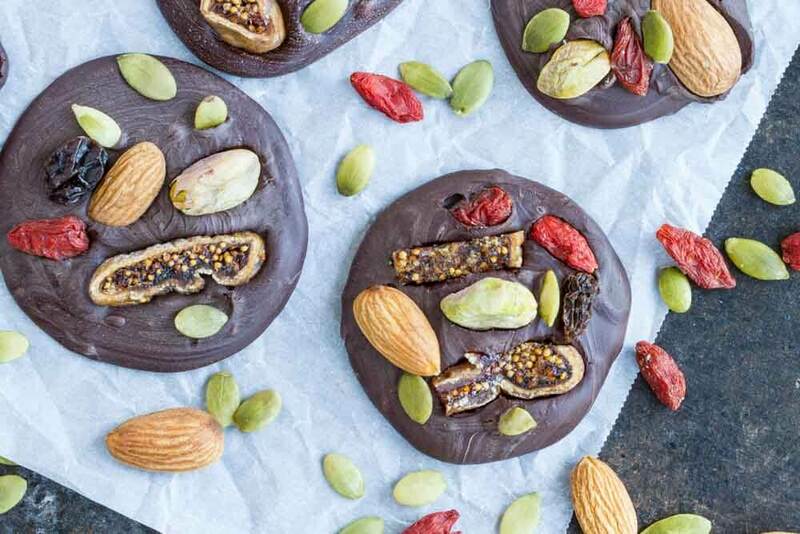 Great for a guilt-free treat or for a little boost of energy when you need it. You can totally control the sweetness factor of these little babes by the type of chocolate that you use. 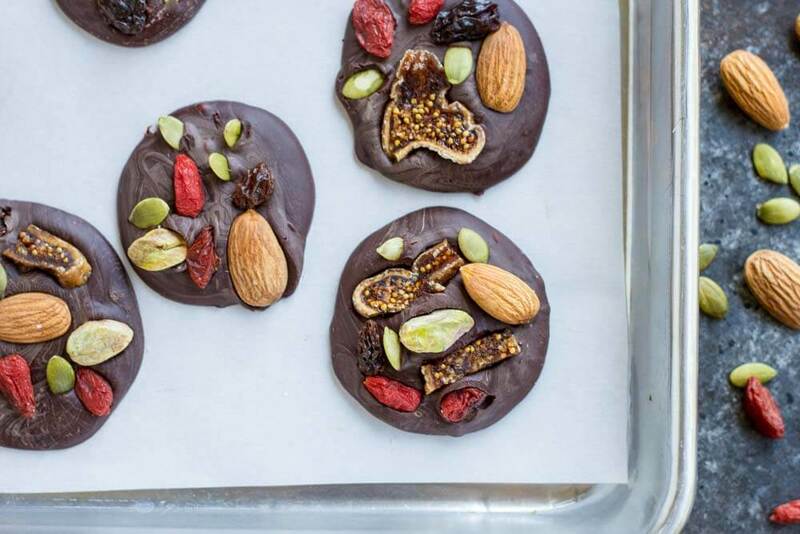 You can use any dark chocolate bar or chocolate chips that you have on hand. 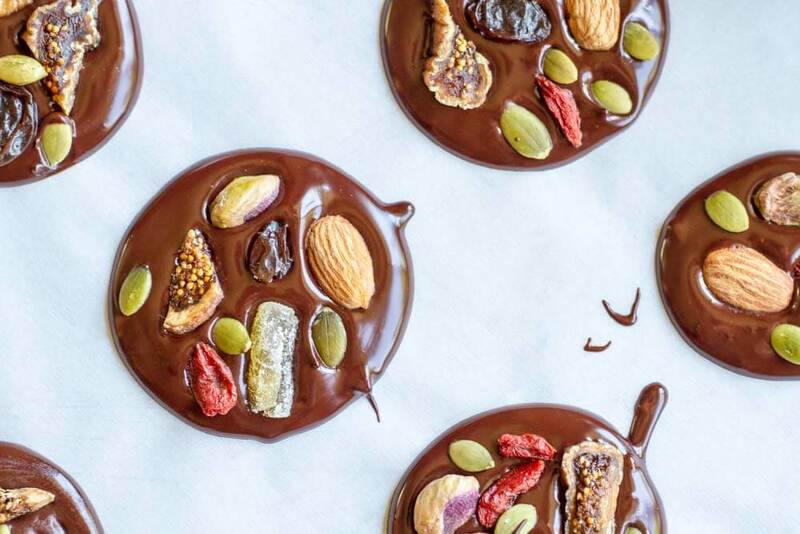 Spoon small circles of chocolate onto parchment paper until all chocolate is gone. Top with desired nuts, seeds, and fruits. Allow chocolates to set. Placing in fridge can speed up the process. You can use any dark chocolate bars or dark chocolate chips that you like. The sweetness of your dark chocolate snacks will be determined by the type of chocolate that you use. If your chocolate is too runny after melting, allow it to cool for a few minutes. 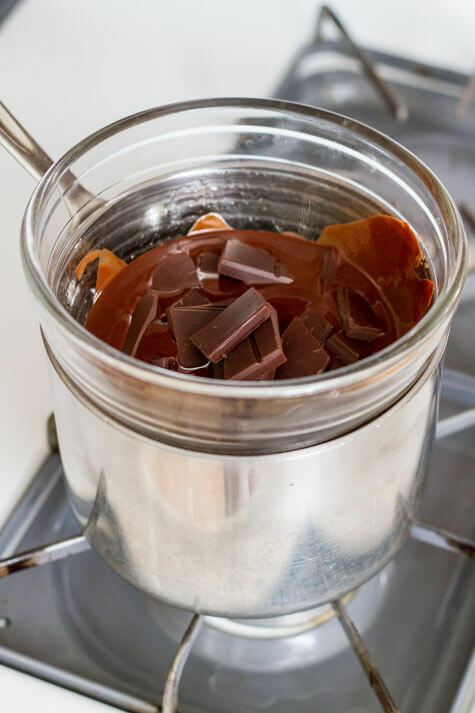 I have noticed if you spoon your chocolate on while too runny, the snacks can turn out too thin and the cocoa butter from the chocolate can separate as it cools, leaving streaks on the surface. These look so good and so easy to make!!! My kids would love making these, I think this is going to be on the list for summer recipes for them to make together. Love those figs in there, yum! They really are fun to make. And the possibilities and endless. Figs are totally my thing. I just love them. I have my kids make there own variations like this, infinitely adaptable and SO easy!! YES! Kids love to make these and to customize them. Yummy! These look so fancy but I can’t believe how easy they are to make! Looks incredible. Thank, Georgina! Good luck with your chocolate adventures. I hope to hear more about it soon. 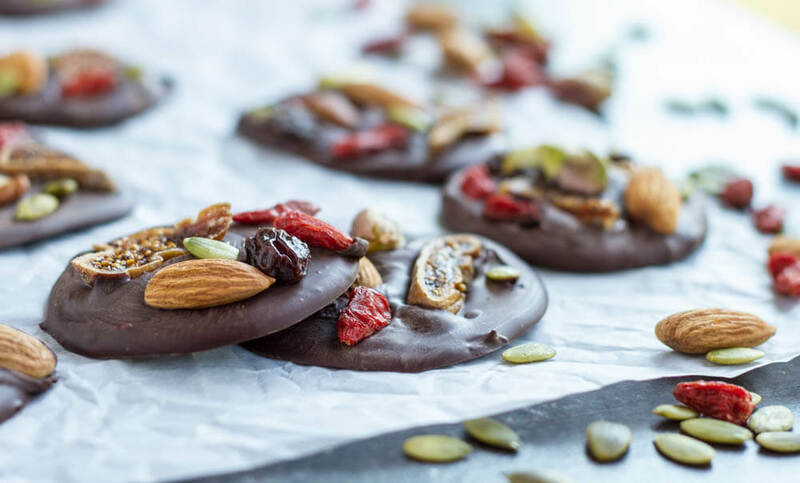 Oh my these look incredible, and the perfect snack/indulgence for after hiking when I get back to the car! Yum! I love this crunchy snack. Only problem is I can’t stop at just one! This looks so delicious, easy and something you can really customize to fit your own personal tastes! Love it! That’a what I love about these. So versatile. You make the best treats! So yummy and your photos are so chocolatey gorgeous! Yum! Love the addition of Goji berries! Yes! And the possibilities are endless! Those teachers must love you! Great recipe, looks very tasty! HA! I love to feed the people I love.